It wasn't all that long ago that cold coffee was something you only drank if your mug of joe sat out too long. I remember thinking the corporate powers had found another way to up-sell what was previously thought to be unsellable, like they did with bottled water and canned air. But iced coffee isn't just for girls with giant goggle sunglasses who don't like “real” coffee. It's a separate, delicious entity, the way English Breakfast isn't compared to the best sweet tea of the South. Iced coffee is a refreshing option when you're looking for something a little heavier than iced tea and less salt and sugar than a soda. A hot, black coffee drinker myself, I find if I need an afternoon pick-me-up I much prefer something like an iced mocha instead of my thick, rich dark roast I drink to open my eyes in the morning. But if you've ever tried to make iced coffee yourself by using the leftovers in the coffeemaker, you realized it doesn't taste the same as when you order it at a coffee shop. The reason is surprisingly simple: You can't make iced coffee with regular coffee because it's too watered down. If you notice, when you order an iced coffee the barista doesn't fill a cup up with ice and pour their hot java over the top, they use coffee that's in a separate container. That coffee has been brewed with a different method that yields more concentrated, and less bitter joe. That process is known as Cold Brewing, and it's incredibly simple to do at home without any fancy gadgets. Not only is the coffee more concentrated, it's sweeter and less acidic as well, since no hot water is used in the process. In a nutshell, cold brewing is steeping ground coffee directly in cold water overnight, then straining. a filtering apparatus: a paper coffee filter, French Press, a fine mesh strainer, nut milk bag, cheesecloth, etc. When cold brewing, use 1 cup of coffee for every 3 cups of water. How much you make is up to you. I reuse a gallon water jug to brew my coffee, but if you have a regular pitcher, say one you would use to make iced tea or lemonade, it may be easier to get the beans in. If you're starting with whole beans, grind them to the course consistency you might use for a French Press. I use a funnel to get the coffee in my jug, but if you're using a pitcher just dump it in. Using cold water reduces bitterness and acidity, and allows the flavor notes of the coffee to come through. Add your water to your ground coffee. Shake it up so all of the grounds are saturated. Let the water-coffee mixture sit on the counter overnight, for at least 12 hours. Some coffeephiles insist on brewing for up to 24 hours. After brewing is finished, I like to give the jug a good shake again. Grab whatever straining instrument you have and strain the coffee into your second pitcher. I like to use a glass carafe that I bought at Ikea for $4. 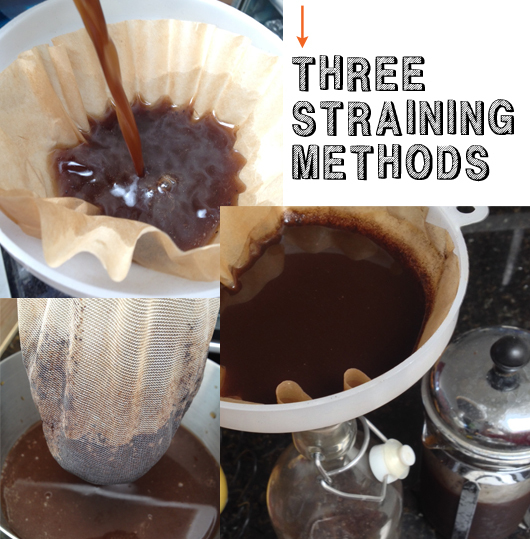 Some folks like a two stage filtering process, one to strain the grounds, then they use a paper coffee filter to reduce silt. I skip that step. You're ready to go! You can start drinking now, or better yet you should chill it in the refrigerator. Full honesty: everyone says to brew at room temperature, but I always just do it in the refrigerator so that it's cold and ready after the 12 hours are up, but that might be heresy. Total prep time, not including steeping, about 5 minutes. 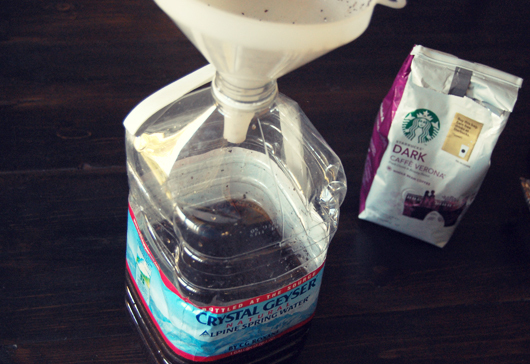 Remember, the cold brewed coffee is a concentrate, so we need to mix something with it to drink it. 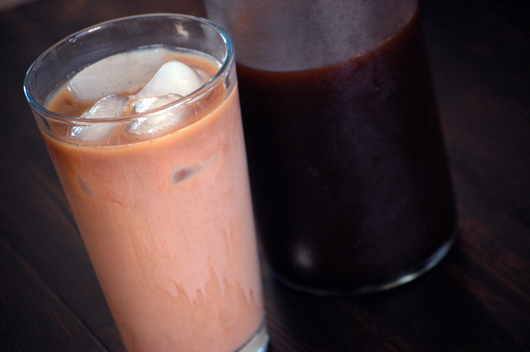 I always make iced lattes, that is, coffee and milk, but more specifically iced mochas – coffee, milk, and chocolate. There are certainly folks out there who add water and ice to their cold brewed coffee and drink it like that, but I ain't one of 'em. For an iced coffee experience that rivals any cafe give the following a try. Fill a glass with ice. Pour in the cold brewed coffee until 1/3rd to 1/2 of the glass is filled. Now, fill the rest of the glass with store-bought chocolate milk. I like to give the chocolate milk jug a good hearty shake beforehand so it gets nice and frothy. Now marvel at your delicious looking coffee swirls in the chocolate. 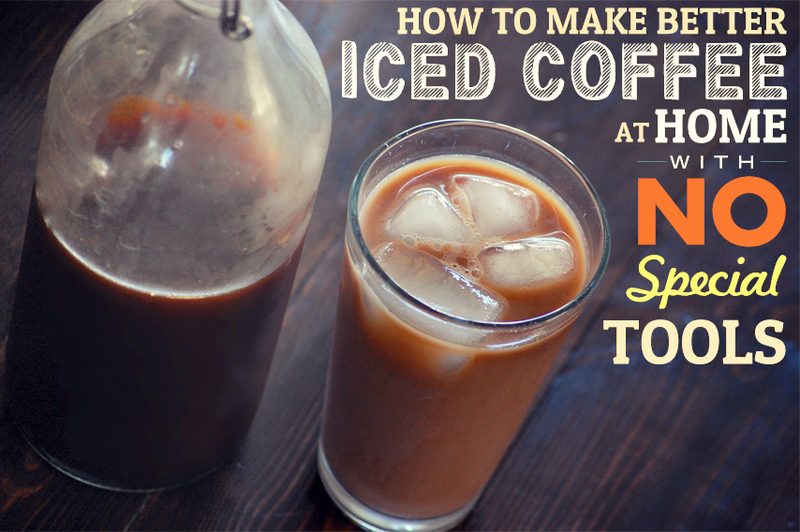 Do you drink iced coffee, your own or cafe-made? Never thought it could be done without another machine. Great post! I’ve found that using a light to medium roast brings out so much more flavor than a dark roast. 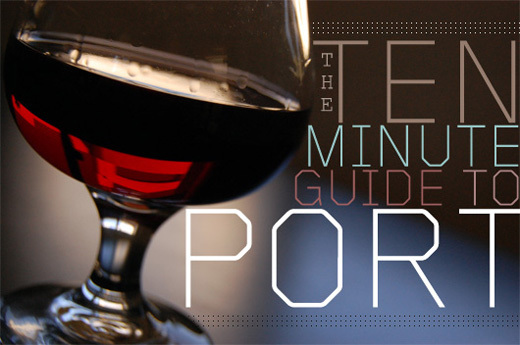 With a 12+ hour steep time you leech out too many tannins with a dark roast and you get a lot of bitterness. What I usually do is at night I get my French Press out and fill it with about 1/2 to 2/3 cup of coarse grounds and 2 cups of water. Put it in the fridge for 12 hours, and in the morning fill an insulated tumbler with the coffee and milk. My reaction the first time making it this way was exactly like when Walter White tried Gale’s coffee for the first time. Don’t forget to freeze some coffee ice cubes so your drink doesn’t dilute when it melts! Good call with the ice cubes! It tried a medium roast once and it wasn’t near strong enough when mixed. I’ll have to try it again. 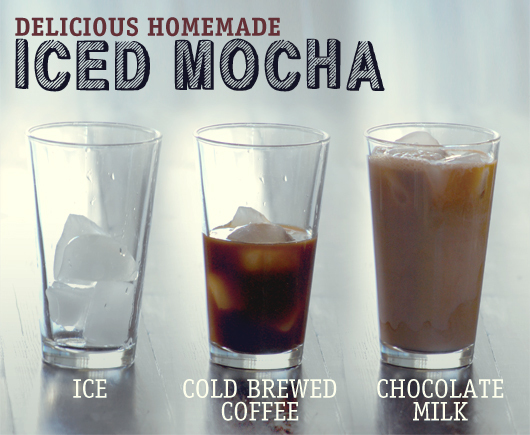 Coffee ice cubes…genius! That would work for those who don’t like their hot coffee piping hot as well. Can’t wait to try both the “true” iced coffee and the coffee cubes. my girlfriend has an espresso maker. i make a double shot of espresso (decaf at night if i just want a tasty beverage), fill up a glass of milk with a few ice cubes, and then slowly pour the espresso on top. The coffee will float on top, but you will have to add another ice cube to prevent the ice from watering down the drink. i do the double shot because it has a much stronger coffee flavor, which i enjoy. #icedmacchiato. damn tasty. I’m in agreement with ducatisteve, I’ve had great expereiences with a medium roast (currently using Starbucks Blonde Roast Verona). I use a Toddy Cold Brew system http://toddycafe.com which makes ~8-9 cups of concentrated cold brew. I’ve brewed for as little as 12 hours and up to 24 (on the recommendation of a friend from Verve Coffee Roasters) and it always comes out great! I use to cold brew. The coffee concentrate required me to use a lot of beans which wasn’t really cost effective for me. Now use a clever dripper and make a cup of coffee with twice the beans. That way when i put it in ice, it dilutes perfectly. When the ice melts, i just used coffee ice cubes to keep the drink cold. Certainly doesn’t taste as good as cold brew but its still better than the stuff i get at starbucks. Yeah I’m still not sure how to feel about the amount of beans required. I haven’t done the math to see how many drinks I’d get out of a carafe, vs how many beans I’m using. This produces some pretty darn good iced coffee in my opinion. Definitely going to try this…I would normally pop the hot brewed coffee in the fridge at night and have my iced coffee in the AM but agree that it is a bit more watered down than the coffee shops iced. I’ve actually experimented with how to make an iced mocha more chocolatey and rich, and I found that the answer is blatantly simple: Hot chocolate mix. Just add 2 spoonfuls of the powdered stuff into every 1 cup of coffee and you’ve got a nice, iced, mocha coffee. Or if you want more or less mix you could, but 2 spoonfuls I’ve found is really the “Goldilocks” amount. Thanks for the idea of the simple Cold Brewed coffee by the way, Andrew! Definitely a great idea! Alternatively, for those who desire iced coffee but do not have the time to use this method, you can make a thing of iced coffee by brewing a double-strength pot of coffee and pouring it over ice in your container of choice. The coffee will be diluted to normal strength and it only takes as long as making a pot of coffee would. To avoid the filtering into another vessel step, I use a 5 x7 cotton bag (bought in bulk from amazon), put in about 1.5 – 2 cups grounds, secure the top w/ a rubber band, and put it in a 2 quart pitcher w/ 6 cups of water. I just leave the bag in there for the 2-3 days it takes us to finish the pitcher, so the brew gets a little stronger each day. I make coffee ice cubes for blended frappes and flavored simple syrups for the best (and easiest) coffee shop style drinks ever!